The barrel of WTI adds to yesterday’s gains near the $54.00 handle. 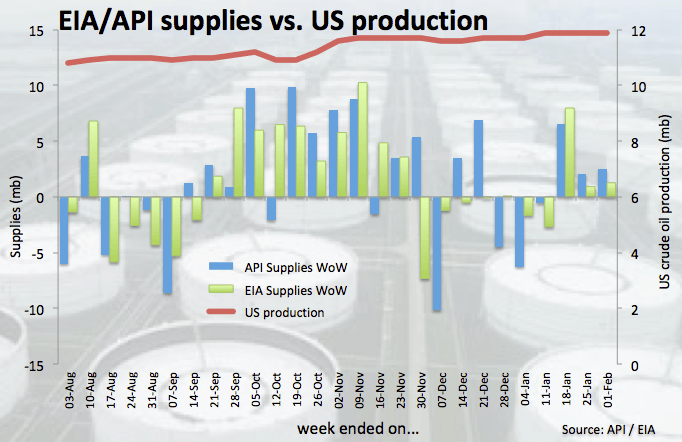 EIA reported nearly 1.3M barrels build during last week. OPEC+ cuts, sanctions on Venezuelan oil in focus. Prices of the American reference for the sweet light crude oil are looking to add to Wednesday’s gains above the key $54.00 mark per barrel. Prices of the West Texas Intermediate are once again flirting with the $54.00 mark today, as traders appear to have re-shifted their focus to the ongoing OPEC+ agreement to curb oil production as well as sources of potential supply disruptions. In fact, the recent US sanctions against Venezuelan state oil producer PDVSA appear to be somewhat supporting prices. The EIA noted that, eventually, the full effects of US sanctions will eventually eliminate imports from the Caribbean country, although the agency “does not anticipate any significant decrease in U.S. refinery runs as a result of these sanctions. U.S. imports of Venezuelan crude oil have been falling for several years and refineries have been replacing Venezuelan crude oil with other heavy crude oils”. In addition, the Sharara oilfield, the largest in Libya, is shut since December and speculations keep running high regarding the potential take over by terrorist forces. WTI, in the meantime, managed to leave behind yesterday’s build of nearly 1.3M barrels during last week, as reported by the EIA in its weekly report. Later in the week, driller Baker Hughes will release its report on US oil rig count (-10 prev.). The current OPEC+ deal to cut oil output remains the exclusive source of support for oil prices, while US sanctions against Venezuelan and Iranian oil exports and the so-called ‘Saudi Put’ are also limiting occasional dips somewhat. Additionally, expectations of further progress at the next US-China meeting (expected at some point later in the month) also adds to the buoyant sentiment. At the moment the barrel of WTI is up 0.86% at $53.80 facing the next hurdle at $55.51 (38.2% Fibo of the October-December 2018 drop) followed by $55.59 (2019 high Feb.4) and finally $58.00 (high Nov.18 2018). On the downside, a breakdown of $53.02 (21-day SMA) would expose $52.73 (low Feb.6) and then $51.13 (low Jan.28).